Another good news that comes from our local mobile manufacturer Cloudfone, there is a Jellybean update available to all Cloudfone Thrill 430x users. They will be doing the upgrade for you so just visit their exhibits at Cyberzone SM Sta. 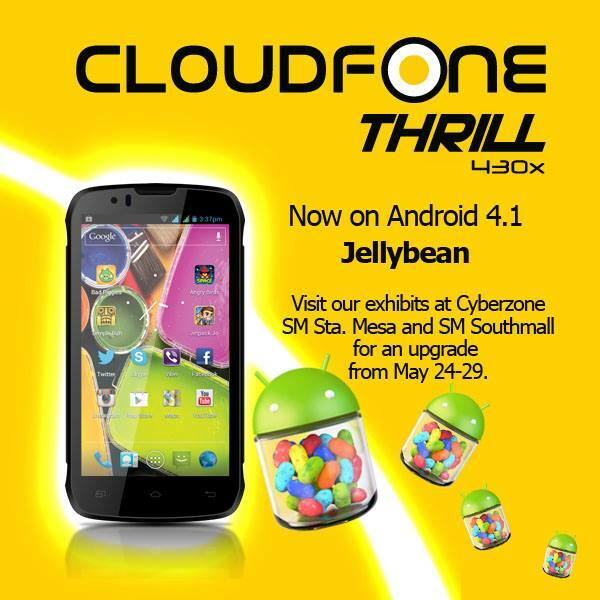 Mesa and SM Southmall from May 24 to 29 to avail this OS update. If you want OTA update for your Cloudfone Thrill 430x, just wait for few weeks from now as they will be sending a link and instructions on how to update you device to Jelly bean. Upon reading the comment on their Facebook page there is no exact OTA update release, will just hope they update us as soon as possible. Before you update just make sure to back up all your needed files on your phone, as this will be wiped out after you update to Android Jellybean 4.1. They don't really upgrade my cloudfone 430x. I went to sm sta mesa many times now and they keep saying this "the technician is not around or we don't have the upgrading tool". Its too bad. They keep drawing things that does not happen. Bad cloudfone.